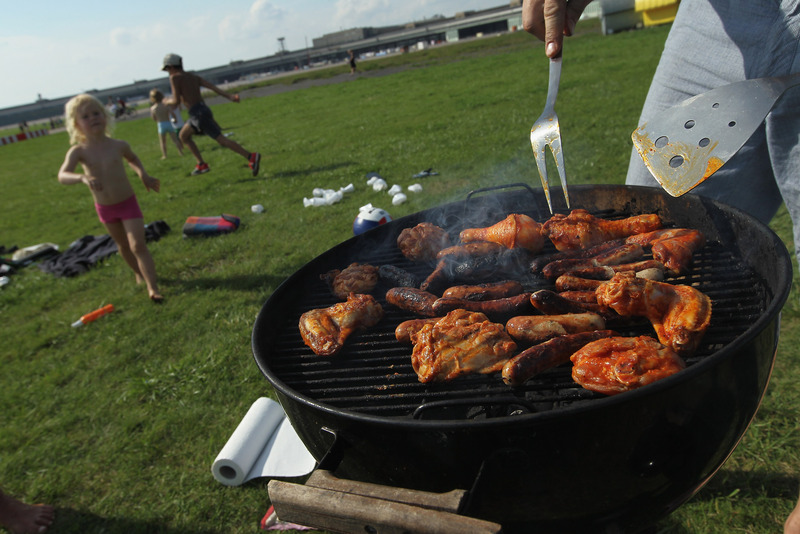 Step away from the barbecue: Your grilled chicken dinner may have given you wrinkles. According to The Daily Mail, one health company has developed a scanner that can calculate your true biological age based on your Advanced Glycation End-products or AGEs. AGEs are "potentially damaging compounds which, at high levels, can speed up ageing" and form when we cook food at high temperatures. So, does that mean we need to go on a completely raw diet to combat wrinkles and saggy skin? Not exactly, but research shows that AGEs are absorbed in our bodies through food which are caused by a reaction between sugars and starches and proteins or fats at high temperatures. The higher the AGEs in our body, the more damage there is to our collagen and elastin, which is exactly what we need to keep us looking young. To lower your AGE levels, research suggests doing less searing, grilling, and broiling and more steaming, boiling, stewing, and poaching. It also suggests staying away from the microwave. Basically, any method of cooking that requires extremely high temperatures and long cooking times should be avoided. Which is, obviously, fantastic news for those of us who want to function like normal human beings. If you plan on taking your chances in the kitchen, there are still other ways to keep your AGEs at bay. Regular exercise, getting enough sleep, controlling your stress levels, and decreasing or avoiding alcohol or smoking can help reduce the amount of AGEs in your body. Steamed veggies and a glass of water for lunch, anyone? Ugh. Can't believe I just wrote that.